It's breakfast time here in the "B" household, and let me tell you: having something prepared casserole style to portion out through the week has been life saving over the past few months since our lives have been so busy. Seriously, the one & only meal that I always prep is breakfast. Because please tell me: who is going to wake up before work and cook a meal? Okay, I'm sure some of you superstar unicorns are out there, but I am not one. I'm lucky to be up & out with enough time to take my glass container out of the fridge and put it into a bag. Forget about eating the breakfast, that is done at work! And speaking of eating breakfast, let's talk about that when it comes to Intermittent Fasting. You guys know I love to fast for the health benefits, and I talk about it often. I aim to do it at least 3 times per week, and sometimes go up to 6. My personal fasting window happens from after dinner until the next afternoon. Yet here I am with another breakfast recipe... why? That's because I just love breakfast foods, and I don't let my fasting get in the way of that. I save my prepped breakfast for lunch time, load it up with all of the savory sauces & toppings, and call it "brunch". 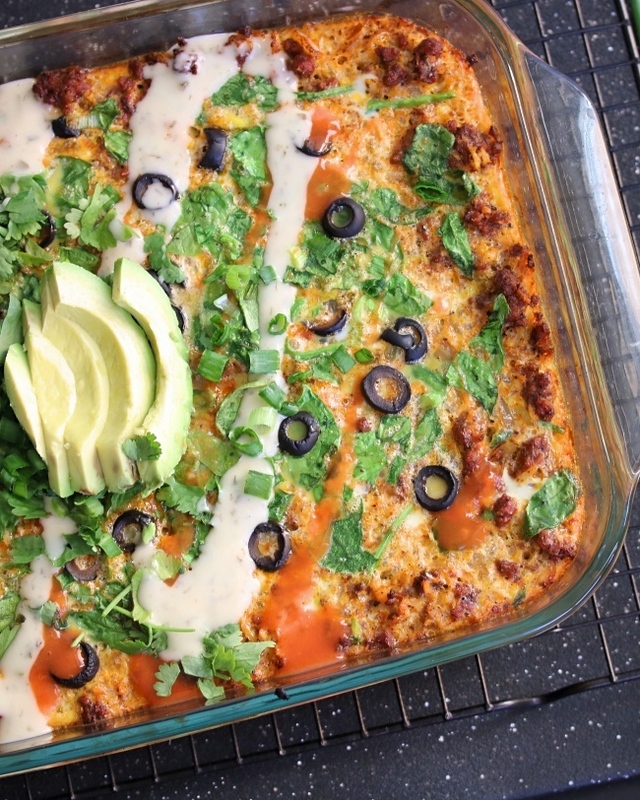 More on Intermittent Fasting to come, but for now it's all about this Enchilada-inspired breakfast. Because holy smokes, it is so dang good you guys! 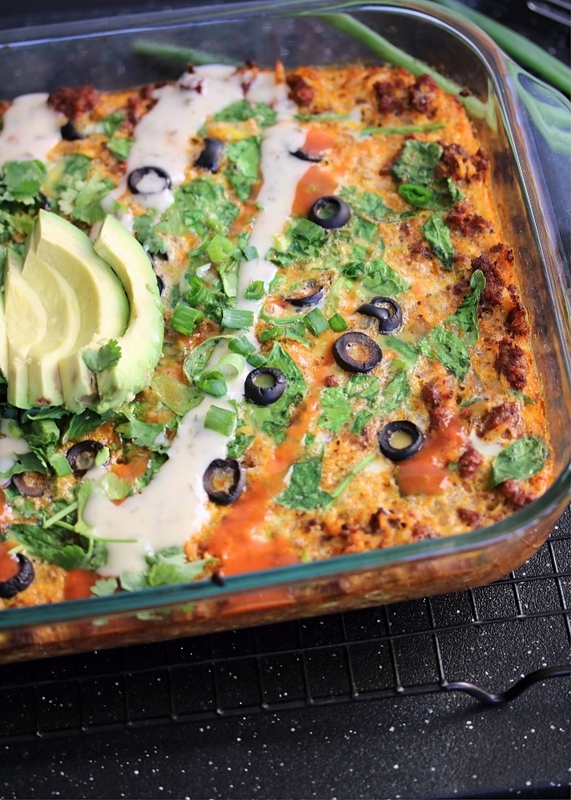 I have had questions from some of you over the last few months asking if my fan-favorite Beef Enchilada Bake could be eaten for breakfast. My answer was "of course!" because you can eat whatever you please for whatever meal according to me. But once I tried it & made a few modifications to make it just right- we've already made this three times! 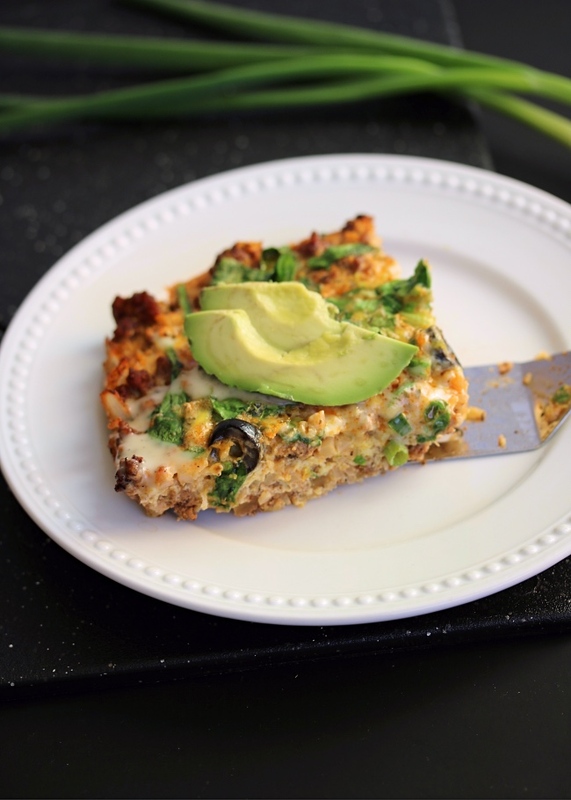 This breakfast bake is loaded with cauliflower rice, but don't be scared! It adds a light, fluffy texture yet makes the dish so filling. And did I mention all of the ground beef and chopped veggies? 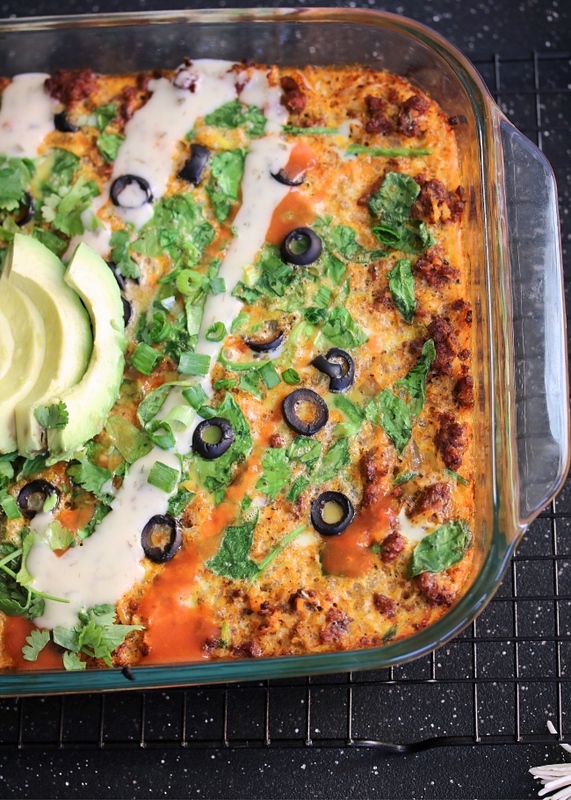 It's flavor & nutrient packed, and seriously delicious with some garnishes piled on top. In a large skillet over medium to medium high heat, sauté the beef, onion, green chiles, and spices until the beef is cooked through. Stir in the cauliflower rice and tomato paste until well combined. In a mixing bowl, whisk the eggs with coconut milk (you can add additional seasonings here too if you wish, I add salt & pepper). Add the chopped spinach and stir. Layer the beef mixture into the dish, followed by eggs poured over top. Sprinkle with olives & green onion if using, and transfer to the oven. Bake for 35 minutes or until set. Top with garnishes of your choice & serve hot! With all of my baked egg dishes, I add a layer of parchment paper to the baking dish to keep everything from sticking. 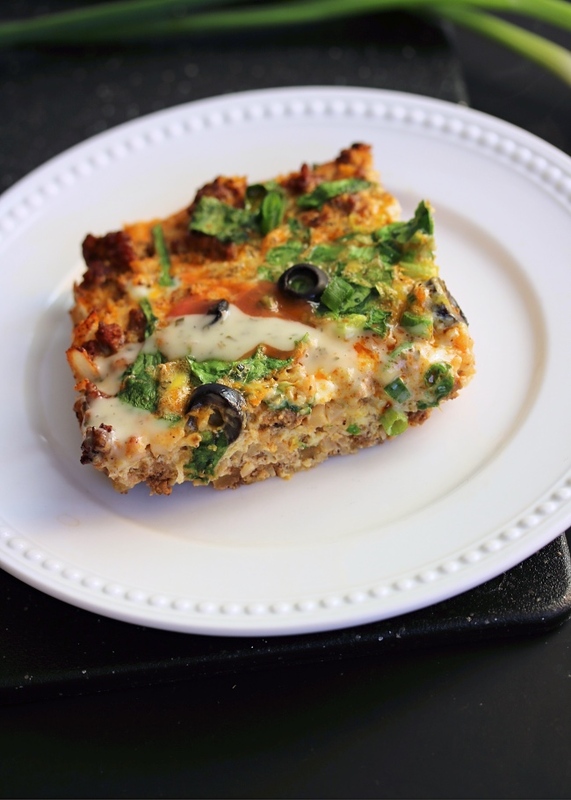 If you tolerate dairy, this would be delicious with a sprinkle of grass-fed cheese! Not into ground beef? Try fully cooked, shredded chicken or beef. If you're vegetarian (I know I have a few of you here!!) try substituting fajita veggies. Can this be made for a meal prep and then reheated or will the eggs get weird? Is there a substitute that you would recommend for the cauliflower? Unfortunately my stomach doesn’t tolerate it too well! Hi Emily! Yes, I make it for meal prep & reheat throughout the week. Turns out great every time!! Anonymous: shredded potatoes or hash browns would be delicious! Thank you, this looks very good. Tonight we are having your Chicken Alfredo "Pasta". I have a question about printing this recipe. When I try to print the recipe it shows as 8 pages or 4. Is there anyway I can get it on one page? Just took out of the oven and it is delicious! I subbed two potatoes that I grated for the cauliflower, added small can of black olives, a fresno chili (omg didn’t realize so hot), added a bit more coconut lite milk and tomato paste to counter the heat. Hello, I made this and love it! What is the serving size? Can this be made up to step six and stored in the fridge overnight so it’s fresh for guests or a potluck? Can this be frozen after you bake it? Can I use kale in place of spinach? Did you try doing this? How did it work out? I have a breakfast potluck tomorrow and was hoping to prep tonight & cook tomorrow. Not sure if cook time should be adjusted if everything is cold. 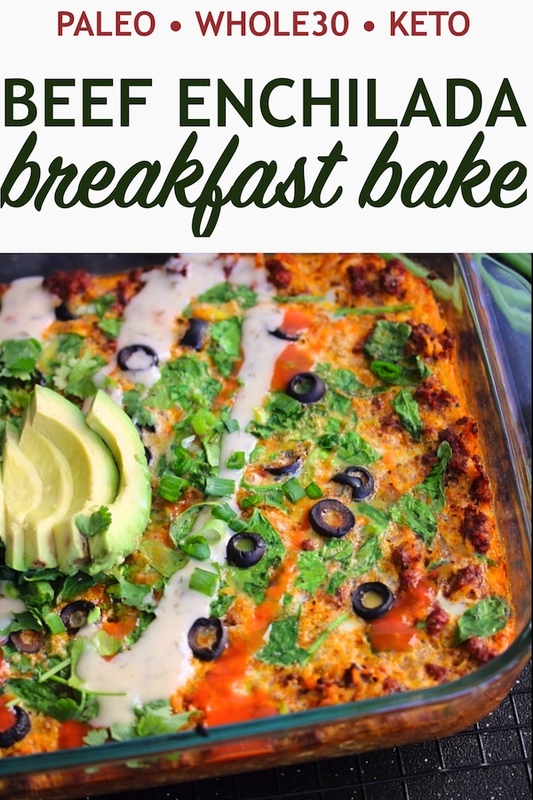 I made this to portion and freeze for 8 days worth of Whole 30 breakfasts. It is deeeeelicious! I wonder if it would be good using sweet potatoes.